Myserverplanet.com “The Web Hosting Expert” is a web hosting company based in Lavendon, near Milton Keynes in the UK. Launched in 2014, the company has quickly become part of the elite in the web hosting world. Just 2 years after the company launched, they were able to move into their own state of the art data center. The founder Nicholas Cocchiarella may only be in his 20s, but he has many years of IT experience under his belt, and it shows! Myserverplanet secured funding from an American company, however, their head offices continue to be based in the UK. This is great news for their customers as Myserverplanet.com now has a secure base in the US too. Myserverplanet.com grew big extremely quickly and attracted a lot of outside attention. Nicholas Cocchiarella retains 100% ownership of My Server Planet. Initially, Myserverplanet.com didn’t own its own datacentres. Instead, they rented space in existing data centers. At first this might sound odd, but is common practice in the hosting world. It means that the company can be selective about what centers they work with and therefore offer you the best deal possible. Leasing servers can actually give the hosting company CEO more scope to test, develop and grow from humble beginnings. This approach certainly worked for Cocchiarella, MySeverPlanet saw an explosion in growth in just a few short years and subsequently got funding from an American company due to their rapid success. In short, although just in its infancy MyServerPlanet owes its success to sourcing the best solutions and leveraging data centers around the world. First Class Uptime and Scalability! The 4 cornerstones of MyServerPlanet.com are summed up in just 4 words: Speedy, Reliable, Scalable and Supported. MyServerPlanet uses a fully redundant network, meaning they can guarantee reliable connectivity with absolutely no excuses. They offer 99.99% uptime, but the suggestion is, in reality, this is more like 100%. How can they do this? Well, because they have connections with lots of different datacentres they can work to secure your service through several sophisticated pieces of tech. This uptime comes at a price that surprises. They are able to offer hassle-free affordability because of their robust business model. They shop around to harness the best resources that use world class hardware and software. Their entry level hosting package starts at just $0.66 per month. Such was the success of MyServerPlanet, they have since managed to purchase their own UK datacentre. This means they can now control the level of hardware and the speed and reliability first hand. They still have connections with other service providers such as BT, Virgin Media, Claranet, Janet and more. Confused? Don’t be. Just know that this company works tirelessly to provide the most flexible solution with the most reliable outcome. And with this flexibility also comes extreme scalability. MyServerPlanet promises to seamlessly grow your hosting package as your business grows. The vision of MyServerPlanet is to help you avoid the frustrating legwork and money that is involved in setting up and maintaining your own server. They are experienced in managing and maintaining the technology, so you experience a quick and hassle-free service. MyServerPlanet offer 24/7 customer support. Although there isn’t live chat on the website, you can open a customer support ticket straight from the website. This means you can provide all the details of the issue in one go, with the added option to upload files. This is a small detail – but small details often matter. Online chat can be time-consuming because you must expand on the problem in a lengthy conversation. Here, you have the chance to give all the details in one go. And they respond quickly. Another feature we like is the client area. This is an area devoted to existing customers, with all the information on your hosting packages that you could possibly want. This allows MyServerPlanet.com to offer a more personal service, as well as giving their customers a clear overview of their products and services. The company is also really active on social media. This means that you can get to know the latest details in real-time and make contact via online messages this way too. When ordering with MyServerPlanet you can choose to pay in US dollars or GB pounds. This obviously represents the international nature of the MyServerPlanet.com, but it means you might save some cash by choosing the appropriate currency as well. The payment methods are what you would expect. There is the option to connect your bank account or pay by debit or credit card. 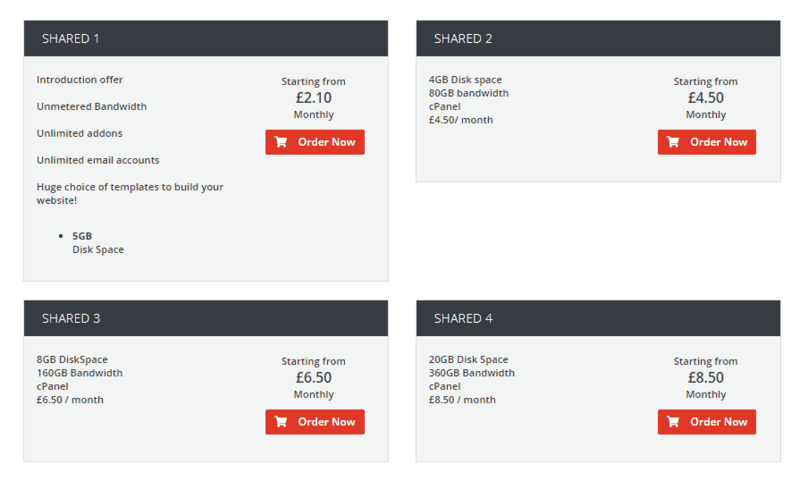 Shared 1: 2GB, unlimited bandwidth, cPanel, unlimited number of sites. $0.66 per month. Shared 2: 2GB, 40.96GB bandwidth, cPanel, unlimited number of sites. $1.82 per month. Shared 3: 8GB, 163.84GB bandwidth, cPanel, unlimited number of sites. $9.48 per month. Shared 4: 20GB, 368.6GB bandwidth, cPanel, unlimited number of sites. $12.40 per month. Dedicated 1: 250GB space, 2×1.80GHz CPU, 2GB RAM. Price $40.56. This is an unrivaled level of choice for both the personal user and the business user. This is one of the major benefits of MyServerPlanet.com. Notice how surprising low the prices are, with entry levels available for just $5 a year. It is unlikely you will be able to find it cheaper elsewhere, and with the promised spec and speed. The features that MyServerPlanet.com offer form the backbone of the company. This is the right thing for a hosting company to be good at, it is an IT provider after all. Some of these features are genuinely impressive. The use of solid-state drives to ensure optimal stability and speed. Backed up by the hundred or so customer reviews – that all boast that MyServerPlanet really does over deliver when it comes to both reliability and speed. Another feature worth raving about is the entry-level package. Even at this rock bottom price, you get 1.5GB of space and 100GB of bandwidth. Which is pretty neat. Using cPanel has become the industry standard, so MyServerPlanet.com doesn’t disappoint here either. The hardware is its unique selling point and something that will make customers happy. MyServerPlanet.com may be a fairly new hosting company but its growth is immense. They experienced a lot of success extremely quickly, enough to get their own state of the art data centre in the UK. Then quickly expanded into the US. MyServerPlanet.com grew at such a rate that they attracted the attention of investors from abroad. That’s pretty impressive! This is a story of extreme success from a group of people who knew how to run a successful hosting business. The team had 10 years of IT experience before founding the MyServerPlanet hosting service and found a way to OWN IT, at low prices, with high-quality hardware, stability, and reliability. MyServerPlanet.com has been phenomenally successful in a very short period of time. So we can be certain they are doing more than a few things right!